This dynamic book offers a comprehensive companion to the theory and practice of Theatre of the Oppressed. Developed by Brazilian director and theorist Augusto Boal, these theatrical forms invite people to mobilize their knowledge and rehearse struggles against oppression. Why and how did Theatre of the Oppressed develop? What are the differences between the 1970s (when Theatre of the Oppressed began) and today? How has Theatre of the Oppressed been shaped by local and global shifts of the last 40-plus years? Why has Theatre of the Oppressed spread or "multiplied" across so many geographic, national, and cultural borders? How has Theatre of the Oppressed been shaped by globalization, "development," and neoliberalism? What are the stakes, challenges, and possibilities of Theatre of the Oppressed today? How can Theatre of the Oppressed balance practical analysis of what is with ambitious insistence on what could be? How can Theatre of the Oppressed hope, but concretely? 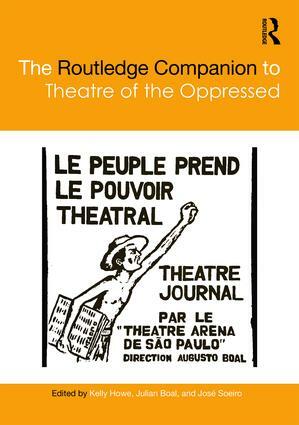 Broad in scope yet rich in detail, The Routledge Companion to Theatre of the Oppressed contains practical and critical content relevant to artists, activists, teachers, students, and researchers. New York and After: Gassner, Realism, and the "Method"
Theatre of the Oppressed as a Dialectical Game? Image Theatre: A Liberatory Practice for "Making Thought Visible"
Legislative Theatre: Can Theatre Reinvent Politics? Theatre of the Oppressed in Senegal: TO "Proposed That We Dare Ourselves to Dream"
Gatherings: Between Market Pressure and "Critical Generosity"
Kelly Howe is a teacher/writer/activist based at Loyola University Chicago. She served twice as president of Pedagogy and Theatre of the Oppressed (PTO) and co-organized three of its conferences. She also co-edited Theatre of the Oppressed in Actions with Julian Boal and Scot McElvany. Julian Boal is a well-known Theatre of the Oppressed practitioner who has realized workshops in more than 25 countries around the world. He recently completed his PhD, entitled "On Old Forms in New Times: Theatre of the Oppressed Today, Between a 'Rehearsal of Revolution' and Interactive Training for the Victims". José Soeiro is a Portuguese sociologist, political activist, and researcher. He is currently a Member of Parliament. He was responsible for "Estudantes por Empréstimo," the first Legislative Theatre project in Portugal, and is one of the organizers of Óprima!—a Gathering of Theatre of the Oppressed and Activism.